Cut the carrots, courgettes and chicken into thin strips. Sear the chicken for 1 minute in a little olive oil. Add the vegetables and brown then deglaze with a glass of water. Leave to cook. Chop the coriander and cut the Brie ILE DE FRANCE® into pieces. Once the vegetables are cooked and the water has completely evaporated, remove from heat and add the coriander and Brie. Add salt and pepper. 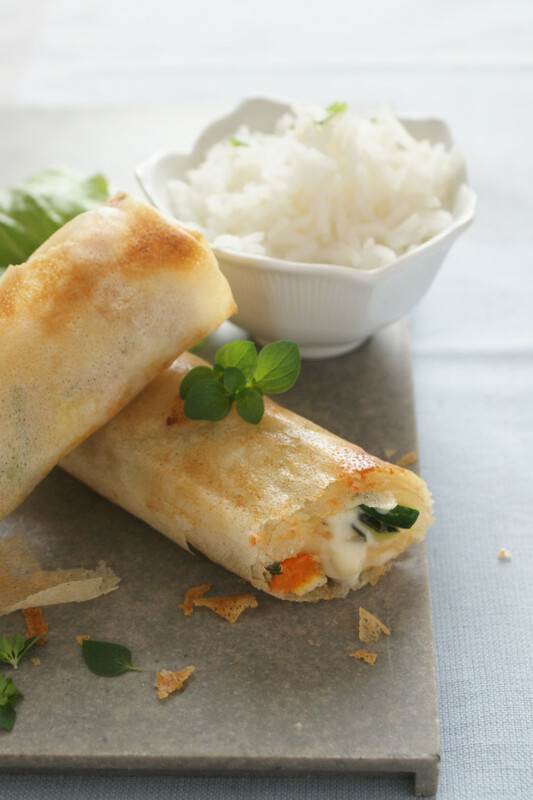 Brush the brick pastry sheets with olive oil, place the filling and shape the spring rolls (fold over the top edge of the pastry to form a tube, then fold in the sides one after another and roll the spring roll). Place on a baking sheet (with the folds downwards). Bake at 180°C (thermostat 6) for 5 minutes on each side. Serve golden brown with a little spring roll sauce and a bowl of rice.